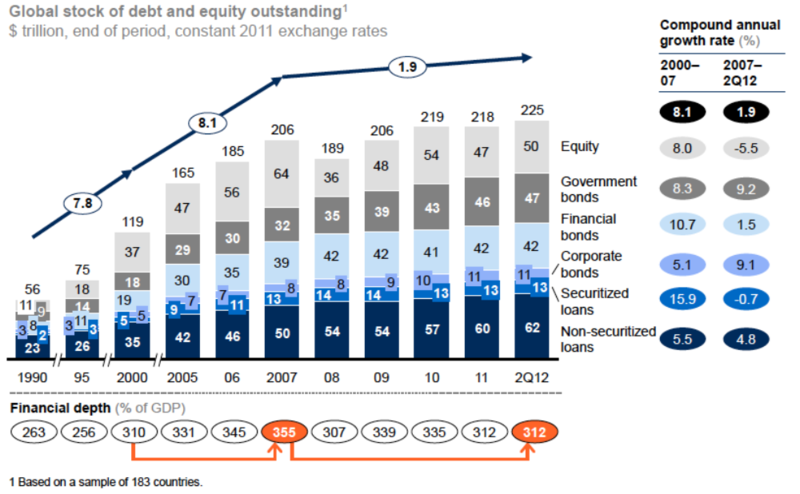 From 2007 to 2012, government debt securities increased by 47 percent (Figure 1) while financial depth rose to 355 percent of global GDP in 2007 from 120 percent in 1980 (Lund et al. 2013: 2). In spite of a massive increase in the stock of global financial assets—equivalent to 302 percent between 1990 and 2012—“[m]ost of the increase in financial depth prior to the crisis was due to financial system leverage and equity valuations” (Lund et al. 2013: 2). Yet the world needs more and better infrastructure, and redirecting finance towards sustainable infrastructure will require a major shift in policy coordination with various stakeholders. For instance, Standard & Poor’s estimated that “institutional investors could provide as much as $200 billion per year—or $3.2 trillion by ­­­2030—for infrastructure financing” (Standard & Poor’s 2014: 2). But “if the right levers are pulled, there is potential to increase investment from private institutional investors by ~$1.2 trillion per year” (Bielenberg et al. 2016: 28). Thus, the problem is not necessarily one of funding but how to direct the finance created by the financial system towards productivity-enhancing investments. In this regard, a number of mechanisms are available to finance long-term investments, and yield-seeking potential investors could contribute to close the financing gap (Figure 2). The OECD estimated that institutional investors held over US$70 trillion in assets as of December 2011 (Della Croce 2014: 8). Many of these investors are moving towards socially and environmentally responsible investment strategies. Also growing rapidly are Sovereign Wealth Funds (SWFs), with assets under management exceeding US$6 trillion in January 2014 (Della Croce 2014: 9). From this perspective, infrastructure has been more widely accepted as a distinct asset class in the past few years (BlackRock 2015a; Roberts et al. 2015; Russ et al. 2010). Infrastructure investments are diverse, as they offer a broad universe of investments ranging from mature assets to opportunistic investment strategies with a variety of risk/return profiles (Figure 3). A study by Russ et al. (2010) concludes that “the asset class’s risk/return characteristics could help pensions mitigate duration risk, due to the long-term nature of many of the sub-asset classes, as well as the return streams associated with certain types of infrastructure. The asset class’s potential to mitigate the impact of inflation on portfolios has also been a driver of investor interest” (8). However, inadequate allocation and assessment of risks of large infrastructure projects are one of the key factors holding back private finance throughout the projects’ lifecycles. From this perspective, a true understanding of investors’ risk appetite and the proper identification of risks and returns over the lifecycle of infrastructure assets are essential to design risk-mitigation mechanisms and incentives to attract institutional investors. For instance, the asset class can be classified by risk buckets, such as core, core plus, value-added, and opportunistic infrastructure (Figure 4). Mature infrastructure (such as large brownfield assets) has core and value-added investment strategies, that is, it typically has income return and capital growth potential. For core assets, most of their returns come from cash yield generating stable cash flow streams. Investors who seek this option look for stable and income-oriented returns with comparatively low risk. Higher-risk growth-oriented infrastructure is often associated with value-added investment strategies. This option, however, has substantially more risks relative to low-risk core infrastructure assets and requires expansionary capex to unlock growth potential. Investors who are looking for potentially higher risk-adjusted returns—or private equity type returns that are more common to greenfield infrastructure assets—tend to invest in opportunistic investment strategies to take advantage of greater total return. However, development infrastructure exposes investors to higher risk–return and capital appreciation potential. This classification is particularly useful to compare infrastructure assets with other asset classes (Figure 5) and different possible investment strategies. Figure 5 displays for illustrative purposes the various types of infrastructure investments that usually fall under those risk categories. By identifying these risks, they can be properly managed and allocated between the public and private sectors in a way that unlocks the provision of funding necessary at different phases over the lifecycle of the project. This is particularly important because infrastructure investments are capable of providing relatively stable returns, portfolio diversification, and liability management for institutional investors. As investors gain exposure to this asset class, their target returns remain optimistic given its risks. For instance, “Preqin reports a net IRR target of 15.8 percent on average (12 percent for developed markets and 19.3 percent for emerging markets). Forty-three percent of funds fit into the target IRR band of 10.1–15 percent and 32 percent into the 15.1–20 percent band. Essential to the achievement of such high IRRs are the substantial levels of leverage in underlying infrastructure projects … Nonetheless, target gearing levels are still predominantly in the 60–70 percent and 70–80 percent ranges” (Inderst 2010: 79). In spite of the huge potential in infrastructure investment—such as portfolio diversification, liability matching, inflation-hedging characteristics, ability to generate consistent long-term cash flows, and potentially high risk-adjusted returns—several factors, which will be discussed later, prevent institutional investors from increasing their exposure to infrastructure assets (Mackenzie 2016). Despite the growing importance of institutional investors, the question is whether there is risk appetite for new infrastructure allocations among them. Even though investors are targeting an allocation of 3 percent to 9 percent of their assets under management to infrastructure assets, the Preqin (2016) survey pointed out that institutional investors have current allocations well below their targets for infrastructure projects, as the challenges facing the sector have increased, including regulatory, political, and macroeconomic risks. For instance, as of 2015, public pension funds were on average targeting a 5.1 percent allocation, but had only a 3.2 percent actual allocation, while for insurance companies the allocations were a 3.9 percent target, but only 2.9 percent actual. 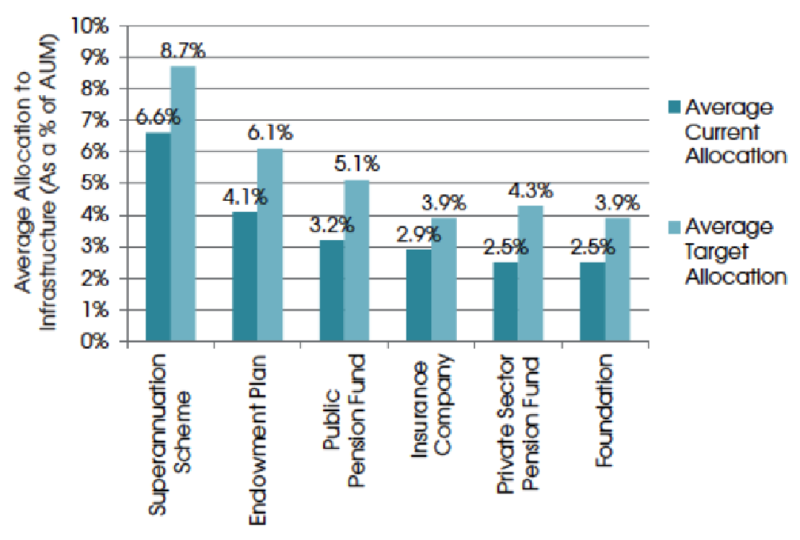 For private pension funds, their target was 4.3 percent as against 2.5 percent actual allocation (Figure 6). In spite of the growing interest of pension funds in infrastructure investments as strategic asset allocation, “all funds that reported a separate target allocation to infrastructure were below targets at the end of 2014” (OECD 2016: 19–20). Notwithstanding several attempts to create all forms of private finance mechanisms, instruments, and incentives to attract private investors, private infrastructure investment has remained low to meet targeted needs—especially during the development stage (Della Croce 2014; OECD 2015a, 2015b). The OECD survey of pension funds shows that they “prefer the more stable investment profile of operational (brownfield) assets and remain opportunistic in their emerging market interest in infrastructure. Prospective risk and return are perceived as higher in new greenfield assets and may require more due diligence on the part of the investor” (OECD 2015c: 20). Attracting investors to bridge the financing gap is no panacea. For instance, “attempts by the UK government to use private funding to pay for infrastructure upgrades … show it is easier said than done. Six years after the UK’s then chancellor, George Osborne, announced a flagship scheme to persuade pension funds to invest billions of pounds in hundreds of new transport and energy projects, there has been little take-up” (Primmer 2017). In this regard, Mike Weston, chief executive of the Pensions Infrastructure Platform (PIP) in the UK concluded that “[m]ost pension funds believe their obligations are best matched by investing in assets that are already delivering predictable cash flow. This means projects that have an operating track record, or at least predictable payment streams” (Primmer 2017). Moreover, a BlackRock report notes that “[t]he infrastructure story is tantalizing—trillions of dollars needed in infrastructure upgrades and a global wall of money seeking yield. Yet the investable universe is small and funds take a long time to invest. Infrastructure debt is long-duration (up to twenty-five years or more) with limited liquidity. This is fine, as long as you are in for the long haul and get paid for your patience. 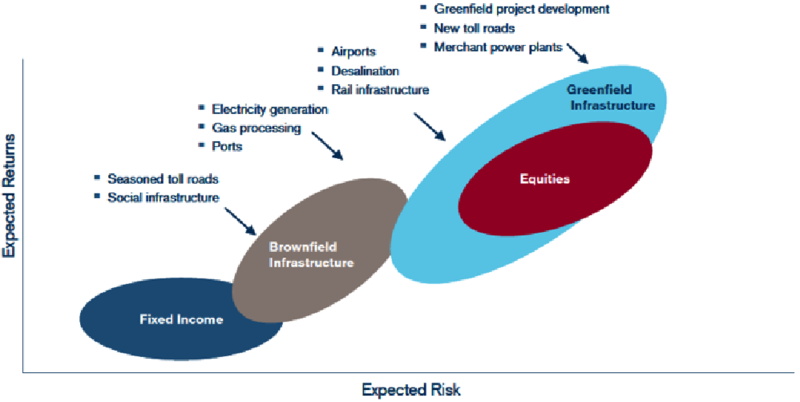 We typically avoid riskier greenfield projects” (BlackRock 2014: 7). In a nutshell, even in advanced economies, where there exist deep and sophisticated financial markets and regulatory, macroeconomic, and political risks are relatively low compared to other economies, institutional investors shied away from infrastructure development. For instance, “UK pension funds investing in UK infrastructure projects has been touted by politicians for years as an obvious win–win but actual deals are almost non-existent” (Primmer 2017). To sum up, despite attempts to develop mechanisms and incentives to attract institutional investors for greenfield projects (see, for instance, World Bank 2015), studies suggest that investors prefer to invest in the lower end of the risk spectrum such as brownfield (or established) projects or in existing infrastructure such as airports and toll roads—to avoid completion and usage risks—and not to invest in the construction phases. Instead, they prefer to invest in built assets, which generate more stable income streams, thus reducing the uncertainty of the cash flows, cost overruns, and delays associated with the early stages of an infrastructure project. This is partially due to its inherent risks and negative cash flows during the construction phase (BlackRock 2015a; Bhattacharya et al. 2012: 14; Standard and Poor’s 2014). 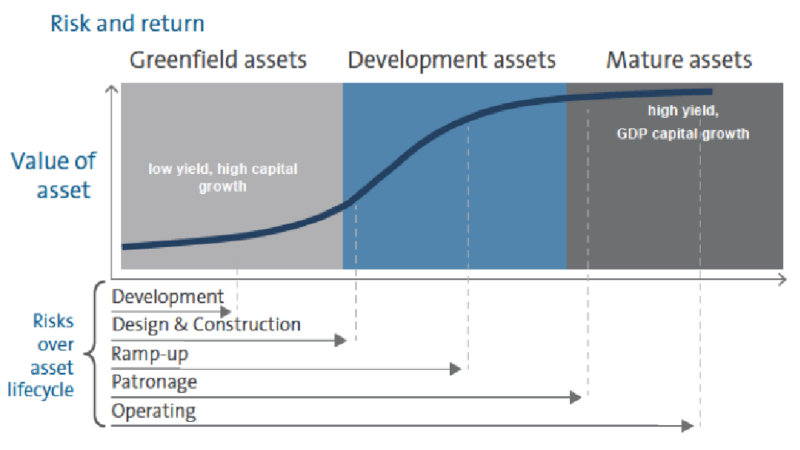 That is, investors focus on investments with attractive risk-adjusted returns such as brownfield projects and already-built and operating assets, which offer predictable revenue streams and lower risks (BlackRock 2016; Bitsch et al. 2010; Primmer 2017). From this perspective, private infrastructure investment is constrained by the inherent risks associated with investing in infrastructure projects (Bitsch et al. 2010). It is interesting to note that “around 70 percent of the current pipeline available to equity investors consists of greenfield projects, which they view as much riskier than brownfield projects that have demonstrated returns” (McKinsey 2016: 23). This, in turn, erodes investor interest and prevents the provision of long-term finance by the private sector. The next post will discuss the additional challenges to bridge the gap between demand and supply of funds through financial markets. AMP Capital. 2013. Understanding Infrastructure. Available at https://bit.ly/2Id5bek accessed Jan 2017. Bielenberg, A., M. Kerlin, J. Oppenheim, and M. Roberts. 2016. ‘Financing Change: How to Mobilize Private Sector Financing for Sustainable Infrastructure’. McKinsey Report. BlackRock. 2014. ‘Dealing with Divergence: 2015 Investment Outlook’. Available at <www.blackrock.com/corporate/en-us/literature/whitepaper/bii-2015-investment-outlook-us.pdf>, accessed 27 April 2018. BlackRock. 2016. ‘The New Prominence of Private Assets Targeting Outcomes in Today’s Markets’. June. Available at <https://www.blackrock.com/co/literature/whitepaper/new-prominence-of-private-assets-en-lai.pdf>, accessed 27 April 2018. Bhattacharya, A., M. Romani, and N. Stern. 2012. Infrastructure for Development: Meeting the Challenge. London: London School of Economics and the G-24. Bitsch, F., A. Buchner, and C. Kaserer. 2010. Risk, Return and Cash Flow Characteristics of Infrastructure Fund Investments. EIB Papers 15: 106–36. Luxembourg: European Investment Bank. Della Croce, R. 2014. Are Institutional Investors the Answer for Long-Term Development Financing? Development Cooperation Report 2014, Directorate for Financial and Enterprise Affairs, OECD. See also <www.oecd.org/finance/lti>. Inderst, G. 2010. ‘Infrastructure as an Asset Class’. EIB Papers, 15(1). European Investment Bank. Lund, S., T. Daruvala, R. Dobbs, P. Härle, J. Kwek, and R. Falcón. 2013. Financial Globalization: Retreat or Reset? McKinsey Global Institute Report, March. Mackenzie, H. 2016. ‘Myth vs. Reality in the Infrastructure Market’. Deutsche Asset Management, Sponsor Interview, April. OECD. 2015a. ‘Infrastructure Financing Instruments and Incentives’. OECD. 2015b. ‘Risk and Return Characteristics Of Infrastructure Investment In Low Income Countries’. OECD. 2016. 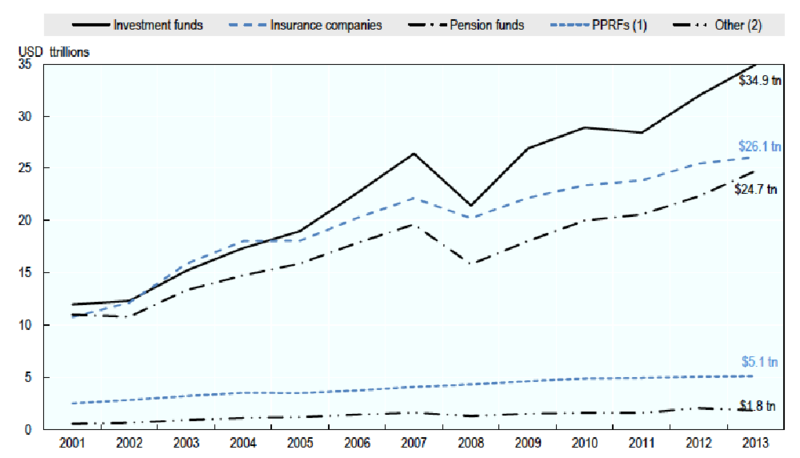 Annual Survey of Large Pension Funds and Public Pension Reserve Funds: Report on Pension Funds’ Long-Term Investments. Preqin. 2016. Preqin Investor Outlook: Alternative Assets, H1 2016. Available at <www.preqin.com/docs/reports/Preqin-Investor-Outlook-Alternative-Assets-H1-2016.pdf>, accessed 27 April 2018. Primmer, G. 2017. ‘UK Infrastructure Projects Struggle to Attract Pension Funds’. Financial Times, April. Roberts, M., J. Patel, and G. Minella. 2015. Why Invest in Infrastructure? Deutsche Asset & Wealth Management Research Report. Russ, D., Y. Thambiah, and N. Foscari. 2010. ‘Can Infrastructure Investing Enhance Portfolio Efficiency?’. White Paper, Credit Suisse Asset Management. Standard & Poor’s. 2014. ‘Global Infrastructure: How to Fill A $500 Billion Hole’. World Bank. 2015. Long-Term Finance: Global Financial Development Report 2015–2016. Washington, DC: World Bank. Note that “Banks, the most important source of long-term financing, lend at significantly shorter maturities in developing economies relative to advanced ones. Moreover, capital markets in developing economies are less developed and are accessible only to a small proportion of total firms. Domestic institutional investors not only have a small participation in developing economies, but also the incentives they face can lead them to invest short-term. However, access to international mutual funds can help developing economies to obtain not only more funds, but also more long-term financing, as these investors hold longer maturities compared to domestic mutual funds” (Peria and Schmukler 2017: 7).